Things looked so good for the Raiders in 2016. They went 12-4. Khalil Mack won Defensive Player of the Year. Derek Carr was in the MVP conversation until a late-year injury. But it fell apart after that, and now the Raiders of the last 10 years have a total of one winning record, no division titles, six different head coaches, and a 4-12 2018 that might not have even been that good. A load of first-round picks in this year’s draft and the arrival of Antonio Brown could portend good things going forward, or it could be a pump-fake on the way to another long stretch of futility. Gruden only knows. Let’s take a look at the best Raiders fantasy seasons of the last decade. You could probably win some bets over whether Carr had more fantasy points in 2015 or 2016. He was a better football player in 2016, but (in part because of the 2016 injury), his fantasy numbers inched ahead the year before. He hasn’t been able to re-create those numbers since, as his 2017 and 2018 seasons have each been a full 50 points behind those two good seasons. With Brown now in town and the team looking at more moves this offseason, Carr will likely get at least one more shot to try to recapture that (albeit modest) glory. Pop quiz for you: Was McFadden’s career a success? He was a fourth overall pick. He only had two 1,000-yard seasons on the ground (only one with the team that drafted him) and only topped five touchdowns once in his 10 seasons. He was done by age 30. That’s a fine career for a mid-round pick, but considering the draft capital extended on McFadden, that’s got to be considered a failure. His 2010 season, though, appeared to be the start of something really good, with more than 1,600 yards from scrimmage and 10 scores. He just never did that again. Interesting note: Crabtree is the Raiders WR leader over the last decade, with Amari Cooper the same year coming in second. Crabtree in 2015 is No. 3 on the list, with Cooper the same year coming in fourth. Maybe no team has had as much shuffling at the receiver position as the Raiders, but for that 2015-17 stretch, it looked like they had something. A note: Michael Crabtree has 77 drops over his career (2009-present). Brandon Marshall leads the way, with 92, but Crabtree is second, with 17 more than anyone else except Demaryius Thomas. Drops and fantasy success have very little correlation, so that’s more an interesting note than anything else, but still. 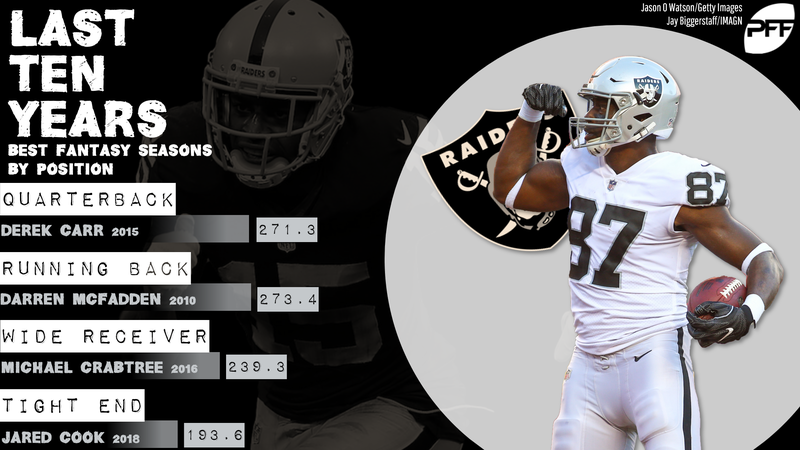 I asked that question about Darren McFadden a couple questions ago, so let’s bring it back: Is Jared Cook’s career a success? He was a third-rounder and has never topped 900 yards. Before last year, he had never topped 760. His career-high in touchdowns is 6 (also last year), and he’s played for four franchises, about to join his fifth in free agency unless he re-ups with Oakland. 2018 was his first Pro Bowl season, and he only has 25 career touchdowns. Still, he’s 10-year into a career as a third-rounder and was just a Pro Bowler. I’m going to say yes to the question, even if it isn’t an enthusiastic yes.